Rick and Debra Dunning have been in the jewelry business for over 30 years starting Emerald City Jewelers in Cleveland, OH back in 1980. In 2001, while their son was attending UC Santa Barbara, they decided it was time to relocate to a nicer climate. Arriving in San Clemente, with the experience they had under their belt, they decided to open Paradise Jewelers, located across the street from Rite Aid on El Camino Real. On any given day, you’ll likely find Rick perched behind the counter, happily ready to help you with almost any jewelry wants, needs, or repairs. You’ll find his wife, Debra, less than a mile away at their second successful jewelry endeavor in San Clemente, Paradise II on Avenida Del Mar. 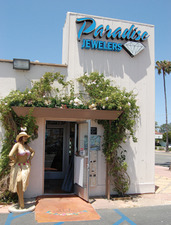 Paradise II was opened in December 2008 and specializes in silver and handbags. With two flourishing stores in town, I had to go in and find out for myself what makes this dynamic duo so successful. Approaching Paradise Jewelers, one of the first things I notice is a life-sized hula girl mannequin outside the door. Eccentric perhaps, but memorable I think to myself. Walking into the store, I am overwhelmed by an enormous variety of items ranging from unique watches and gleaming jewels to sports memorabilia and figurines. Every direction I turn there is something glistening and I suddenly feel like a kid in a candy store. Looking to my left I see a beautiful antique broach, dated 1885, and when I look to my right I see an original Babe Ruth signed pitching award given to George Uhle in 1939, a pitcher for the Cleveland Indians. Thirty percent of Rick’s inventory comes from estate purchases, 20% from his own custom designs, and the rest is purchesed from manufacturers all over the world. An entire display case is dedicated to antique jewelry dating as far back as the late 19th century. In it you’ll find many diamond rings in intricately designed mountings, also broaches, coin collections, and even a one thousand dollar bill. In addition to this amazing list of treasures, Paradise carries over 800 ring mountings and over 400 GIA ( Geological Institute of America) certified diamonds. The huge selection of diamonds and settings available is what sets his store apart from others and Rick says that he can do just about anything you want with them. When he started his store back in Ohio, Manny Ramirez would frequently come in and purchase jewelry. Rick said that Manny was very friendly and would chat with his young son. “See he’s right up there”, Rick says as he points to a photograph of a clean cut, very young looking Manny Ramirez signing a ball for his son. When he made it big and the Indians made it to the 1995 World Series, Manny asked Rick to custom design a piece of jewelry for him. Later in 1997, Manny made it to the World Series again and he traded in his ’95 piece for another “Rick original”. Now Rick displays the ’95 Manny piece in his store. In addition to this, he has over a dozen Babe Ruth signed items and several autographed photos, awards, balls, and sports cards from numerous players from the MLB and NFL. If it’s not treasure you seek, but treasure you want to get rid of, Rick can do that too. HIs former store in in Ohio remains one of the largest estate buyers in the state. He will also sell your unwanted items for you on E-bay. He takes professional quality photos of the item, posts it online, and pays for the shipping for a percentage of the profit. Or you can simply sell it to him right in the store for immediate cash. Get in touch with Paradise Jewelers at (949)361-6661, Paradise Jewelers II at (949)361-6662 or visit their website www.paradisejewlers.com.